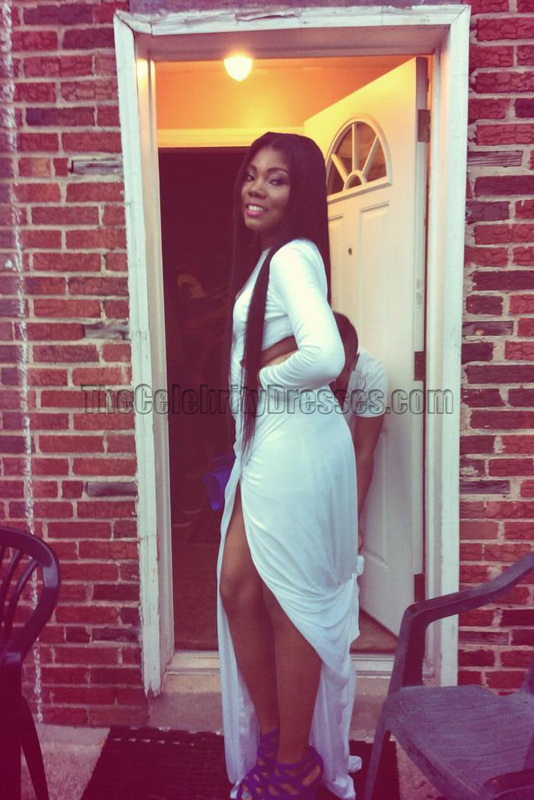 Stunning white long sleeve formal dress inspired by Gabrielle Union. She arrives at the Clive Davis and the Recording Academy's 2012 Pre-GRAMMY Gala, held at the Beverly Hilton. She looks gorgeous in a white cut out long prom dress! A: Dear Renee, We juts sent the picture of the back to your email. Please check it. Thank you for your interest. Q: Can i see the back of the dress..
A: Hello, The back will be like this one http://www.thecelebritydresses.com/celebrity-dresses-elisabetta-canalis-white-cut-out-gown-prom-dress-at-the-sanremo-music-festival-2011.html .Thanks for your question. Q: I was wondering if you could lower the slit to more above the knee? & if my prom is on may 25, & I order today, will it come on time? A: Dear Namantha, Yes, we can lower the slit for you if you request. This dress is made to order. Currently(May) new orders will arrive about three weeks. We can put priority on your order. If you order now, the time is OK. Please include your request in your order comment. You will be able to leave comment at the last step checking out before making payment. You can also email us or contact us by live chat after your order is placed. Thanks for contacting us. A: Dear Abi, We are so sorry but we can not change the design.Actually our dress makers highly suggest that you keep the original design since it will present its beauty best.Thanks for contacting us. Q: How long is the dress? What's the length measurements?? A: Dear Siyonna, The length is different from sizes. Please check your size here http://www.thecelebritydresses.com/html/All-You-Need-To-Know.html?tab=2 . Thanks for contacting us. Q: My prom is May 16th, if I order this dress this week do you guys have over night shipping? A: Dear Erica, This dress is made to order. Currently(April) new orders will arrive about three to four weeks. We can put priority on your order. But it is not 100% guaranteed that it will arrive in time. We have some dresses in stock and these dresses will arrive just about one week. Please check the below link: http://www.thecelebritydresses.com/ready-to-wear-dresses.html And some under this link(please check the Short Description to check the size in stock) http://www.thecelebritydresses.com/top-sellers.html Thanks for contacting us. A: Dear Adja, This dress is made to order. Currently(April) new orders will arrive about three to four weeks. We can put priority on your order. If you order now, the time is OK. Please include your request in your order comment. You will be able to leave comment at the last step checking out before making payment. You can also email us or contact us by live chat after your order is placed. Thanks for contacting us. Q: If I order this dress today in red and put a rush on it will it be here by May 5th. A: Dear Kennise, This dress is made to order. Currently(April) new orders will arrive about three to four weeks. We can put priority on your order. But it is not 100% guaranteed that it will arrive in time. We have some dresses in stock and these dresses will arrive just about one week. Please check the below link: http://www.thecelebritydresses.com/ready-to-wear-dresses.html And some under this link(please check the Short Description to check the size in stock) http://www.thecelebritydresses.com/top-sellers.html Thanks for contacting us. Q: I want my train to be way longer than this, but how long is the train? A: Dear Adja, The train of this dress is about 20 cm. Yes, we can make the train longer if you request. Please include your request in your order comment. You will be able to leave comment at the last step checking out before making payment. You can also email us or contact us by live chat after your order is placed. Thanks for contacting us. Q: Is it possible to make the split in the front a little longer? A: Dear Christine, Yes, we can lower the slit in the front. Please include your request in your order comment. You will be able to leave comment at the last step checking out before making payment. You can also email us or contact us by live chat after your order is placed. Thanks for contacting us. So many thanks to our customer to share her beautiful photo.So Stunning!